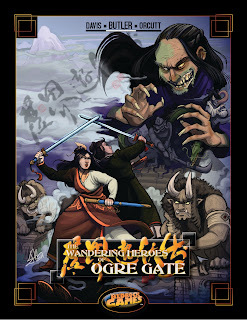 This is the campaign log for the tenth session of a google+run Wandering Heroes of Ogre Gate campaign. The previous session is described HERE. This campaign has been interesting to watch unfold. The party has been interested primarily in building up a base of power in the region by forging alliances with corrupt officials, key sect leaders and supernatural forces. Such arrangements have not been without cost, one player character has lost permanent points in Hardiness. This session he may have condemned himself to an early and painful death. But though such exchanges they have managed to do things like take control of a local group of bandits and inn. One of the big reasons for their success, beyond natural talents they possess, is they've slowly begun to venerate and serve the Demon Emperor (an ancient and powerful evil exiled from existence that longs to return). One thing that became important this session, or at least that the players started to become more aware of, is Fate. In Wandering Heroes of Ogre Gate, Fate is real and can be deciphered through a number of means such as astrology. It isn't a future set in stone, it is more about your life having a trend or connection to something else. I roll Fate randomly before play and my campaigns have been informing the tables as I run them. Here are the events of the session. THE TEMPLE OF ENLIGHTENED DISARRAY After meeting with General Dee in Hu Qin, Bone Breaker, San and their retinue went to Stone Forest Hill to meet Prince Yuan. He granted an audience and they asked for his help eliminating Hu Gao. The prince summoned a priest who asked Jade Priestess, Bone Breaker and San to write their name on a Turtle Shell. He explained he wanted to take a divination before determine how to proceed with them. San refused, but Bone Breaker and Jade Priestess both wrote their names on the shell. The priest then brought the turtle shell to a fire and burned it until it cracked, going to the prince's ear and whispering something. The Prince suddenly seemed more friendly to the party and said he would help. After a discussion the Prince recommended that they go to the Temple of Enlightened Disarray in the heart of the Yellow Forest. He felt that, based on the priest's reading of the shell, they might have luck there. When asked about the temple, he informed them it was a reclusive order who occasionally intervened in human affairs by lending out powerful artifacts. 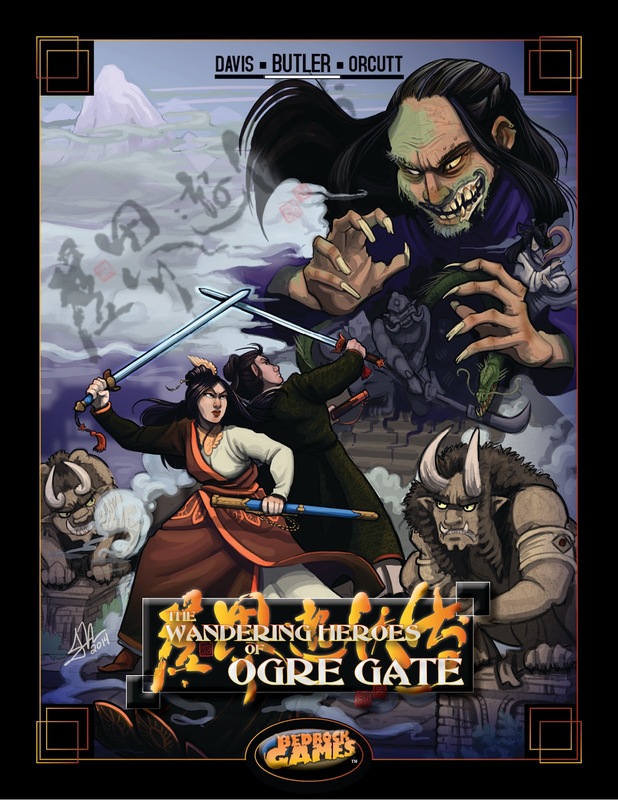 Before leaving Bone Breaker sent a message to the Chen at Ogre Gate Inn, asking him to treat the ambassador from House of Paper Shadows like a king (he had arranged a meeting with the House of Paper Shadows during his meeting with General Dee). On their way through the Yellow Forest, the party was attacked by man-eating Yellow Birds, who were easily concealed by the foliage. The prince was terribly wounded in the attack, having his neck bit. San was nearly bitten as well but managed to evade the swooping birds with her Whirling Dodge technique. Jade Priestess used Blasting Blade to slice through two of the birds. Bone Breaker killed one using Clutch of the Hawk and San destroyed another with a powerful kick. After the battle Jade Priestess used her Qi energy to heal the prince. At the Temple of Enlightened Disarray a junior monk brought them into circular chamberr below ground with eight passageways extending from it. Abbot Kung Xu came and spoke with them. The party explained that they were trying to defeat Hu Gao and needed help. The Abbot asked "Blood shed or Cunning?". At first Bone Breaker said both, but when the Abbot said they had to choose one, he selected "cunning". With that a young monk named Jinfu came from one of the passages carrying a bronze Gu, or ewer. The Abbot explained that this was the Bronze Gu of Zhao. That they would lend it to the party to help them deal with Hu Gao but it must be returned and Jinfu would be its caretaker while they were using it (also, if Jinfu or the Gu were harmed the temple would kill them all). According to the Abbot anyone who drank from the Gu lost ten years of their personal memories with each sip. He clarified that this would not eliminate a person's Kung Fu or talents, just that it would erase memories of people and feelings. They took the Gu with them and headed for Goaxing. On the way, Bone Breaker explained to Prince Yuan that the scroll was now in the possession of General Dee. This created some tension and disagreement. The Prince explained that he had been hatching a ten year scheme against Hu Gao with the Wall Scroll and that the scroll itself would bring back one of the Demon Emperor's Ogre Generals. Now that it was possessed by Dee, the Prince would lose the favor he was hoping to gain with the Demon Emperor. They resolved to deal with the matter after they handled Hero Gao. On their way to Gaoxing, Bone Breaker awoke during the night sweating and feeling strange. Looking down he saw his hands appeared long and thick skinned. The next morning the party awoke to find him missing. Jade Priestess was adamant that they had to find him quickly. They searched all day but could not find him. Bone Breaker awoke by a river drenched in blood to find the body of a peasant facedown in the water. Inspecting the corpse he saw its face was ravaged and its bones crushed by something powerful. He tried to find a settlement but got lost. Two days after he disappeared the party found him wandering the woods. Jade Priestess told Bone Breaker that his ritual to the Demon Emperor must have worked and that he was transforming into something during the hour of the Monkey. Slowly he would gain control of the power, but in its initial phases they would need to restrain him at night. Back at the Ogre Gate Inn Chen makes a deal with a local scholar to help him sift through the paper work at the inn and find the secret ingredient to the establishment's signature dish: Dragon Eating Gold. He learned it was it was a type of numinous mushroom found inside the trapped tomb below the inn. Shortly after this, a member of the House of Paper Shadows arrived and was given a room. In Goaxing Jade Priestess looked for chains or a cage to protect Bone Breaker at night. Meanwhile San, Prince Yuan and Bone Breaker inspected local wine houses looking for one that Hu Gao might frequent. They found one and threatened the family of the proprietor forcing him to secretly serve wine from their magic Gu to the greatly feared martial hero on his next visit. When Hu Gao arrived he was at first suspicious of the innkeeper's sudden nervousness, but calmed when told that the innkeeper was worried about his daughter's health. He drank the wine from the Gu and soon stared blankly at the wall. After a few moments, he stormed from the wine house, smashing the door on his way out. Jade Priestess secured manacles to help manage Bone Breaker's transformations. And suggested they chain him to a tree each night, at a safe distance from everyone else. Armed with this security they left Gaoxing for the Yellow Forest to return the Gu. They brought the Gu back to the Temple of Enlightened Disarray and Bone Breaker tried to work out an agreement with Abbot Kung Xu. The Abbot invited him to a private audience and said he could not enter into any kind of alliance but that he seen Bone Breaker's fate, that he was entwined with the Demon Emperor and with the Kushen (as friend, ally or victim he could not decipher). The Abbot further explained that their temple was devoted to Qi Zhao and sought to manipulate history by being in alignment with nature itself, using forces of good and evil for the ultimate betterment of the world. He hinted that Bone Breaker and his party would have some use in this respect and that while he was not their friend or ally, they should return in the future when they need assistance. He might be willing to help. The party returned with Prince Yuan to his palace and agreed to go with the prince to General Dee in Hu Qin to take back the wall scroll. General Dee was upset that Bone Breaker revealed the Wall Scroll was in his possession but in the interest of avoiding a war with Li Fan, he gave back the wall scroll under the condition that Bone Breaker informed him when the prince was close to unlocking its powers. They went back to the Ogre Gate Inn and to make a deal with the House of Paper Shadows. On their arrival Chen explained that the secret ingredient for Dragon Eating Gold was in the Tomb of General Dou Lun. Bone Breaker went to visit Zhang Kang, asking him to tunnel from his lair into the tomb (hoping to find an area less trapped). He persuaded Kang Zhang, telling the snake-eyed bandit king that he now had many followers on the surface and that his following was growing greater by the day. He and Zhang Kang slowly made their way from chamber to chamber in the tomb, triggering traps to detect their location and eventually made it safely to a burial chamber with a stone coffin bearing a memorial dedicated to General Dou Lun. There they found the mushrooms and took some with them. Kang Zhang told Bone Breaker he wanted a temple dedicated to his honor and he wanted to awoke in the morning to the sound of his followers singing. The cook prepared Dragon Eating Gold and the party hosted a private dinner for the House of Paper Shadow Emissary. He explained that they could summon shadows upon the wall to attack their enemies, performing a demonstration himself. In the demonstration a shadow puppet appeared on the wall when he played a horn and it cut off the arm of Bone Breaker's shadow, causing his left arm to be completely paralyzed. Impressed, the party asked to work with the House of Paper Shadows. The organization agreed to send five horn players to the inn to assist them, in exchange for helping them create an information network in the area. The party then went south to Heaven's Canyon to the jade halls of Heaven Palace Sect. Chen had already been to the palace before and discovered they may be able to make the land more fertile in the area around the inn (for a price). At first, Bone Breaker sought an alliance with Heaven Palace but was told they make no alliances, that they only provide solutions to problems for a price. In the middle of Jade Hall, Bone Breaker asked how the Heaven Palace sect could grant such requests. Qinwen the Keeper of the Seven Talismans and head of Heaven Palace Sect said he could bend reality to his will. When Bone Breaker asked what it would cost to make the lands around the inn fertile, Qinwen told him the price would be heavy but he could not specify its nature until after the transaction (though he did indicate it would likely involve loss of life for someone close to the person who benefited from the solution). Bone Breaker tried to convince his sister, San, to make the request, but she refused, not seeing the wisdom of making deals with a strange man in a jade hall. Eventually Chen volunteered and as asked to approach. Qinwen present him with a stone and asked for a drop of blood. When the blood touched the stone, golden letters glowed on the stone's surface reading "The price is Bone Breaker will die painfully in exactly five years." Returning to the Inn, Bone Breaker discussed with Jade Priestess ways around his new fate. They also began planning a venture into the Kushan Basin to find the Face of Vaagu.